Daniel Chenoweth is from El Cerrito, CA where he studied Tap, Jazz and Partnering from Katie Maltsberger. While studying at Skidmore College he received a Bachelor of Arts in Biology and a Bachelor of Science in Dance Performance, receiving honors in each as well as performing works by Ohad Naharin, Robert Battle, Robert Moses Kevin Wynn, Alex Ketley, and Melecio Estrella. 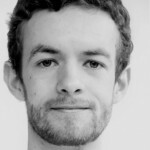 Daniel joined BodyStories: Teresa Fellion Dance Dance in 2012 and also performs with Jennifer Mellor Dance Project.